It is far less expensive to keep a road in good condition than to repair it once it deteriorates and requires intensive repair work. Cold asphalt is a quick and easy way to make these repairs. because it can be applied right from the bag. Out of the bag the coldmix is soft and sticky and doesn’t require any heating. It flows easily into the pothole but quickly hardens once pressure is applied. Cold asphalt doesn’t require any applicators or heavy rolling machines. Once the coldmix has been shoveled or poured into a pothole it can be compacted with a hand tool or driven over with a car. The result is a repair that is stronger yet more flexible than the original hot asphalt. Due to it’s ease of use and the long lasting results – it has become very popular among contractors, business owners and the home handyman. Bitumend Coldmix is a high performance cold asphalt solution. Our Cold asphalt is of an incredibly high standard. 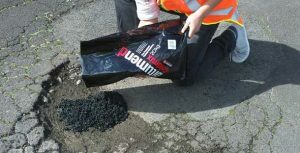 A quality polymer-modified cold asphalt, provides a permanent solution to filling potholes, repairing roads, edge repairs, car parks and driveways. It effortlessly flows from the bag, easy to work yet sets quickly when compacted. Our coldmix was originally designed in New Zealand, by New Zealanders for the New Zealand environment. Our formula uses a combination of large and smaller stones forming a strong stone on stone matrix. This creates a solid bond that can handle real pressure in harsh environments. We then add a pressure sensitive polymer making the coldmix set incredibly hard but still flexible enough to handle any movement in the road. In fact our premium stone has been approved and certified to be used on our state highways. We have proven through research and development that our cold asphalt provides a long lasting solution that more often lasts longer than the original asphalt surrounding the repair. Coldmix can be applied directly to the potholes with little or no preparation work. We suggest sweeping the hole of any debris and making sure the hole has a good edge for the coldmix to bond against. If the hole is fill of water – don’t worry, the coldmix will dispell the water. Coldmix is not dependent on warm weather. It can be applied in any weather condition. Once the cold asphalt has been compacted the pressure sensitive polymers are activated and the repair is complete. It is then possible to drive over the repair. If there is a requirement for it to be walked over immediately then we suggest brushing some dust over the repair. This will allow you to walk on it without picking up any asphalt. If the foil bags are stored un-opened, then it will have a good 12 months shelf life. If opened and resealed properly then it should last another 6 months. If left open to the air, then coldmix will slowly harden within a couple of days. Eliminates the requirement for a temporary repair which means you won’t have to redo any repairs. Minimizes wastage from left over asphalt hotmix. Reduces downtime as the coldmix can be used in all weather conditions.